December 18th: Happy Holidays & So close to our goal! Sorry for the lack of newsletters lately - there was a bit of a problem with them and didn't get out one before Thanksgiving as intended. But we're getting them back up and running now! We wanted to let you know we are sooooo close to our 2015 sales goal of $100,000. We are just above $98,000 with two weeks of sales to go! So, take a close look at what's available for your holiday food needs until the end of 2015. And a big thank you to everyone for helping us get there (We're being optimistic)! We will be sticking to the regular order/delivery schedule through the end of the year. We hope to add a second delivery day in July 2016 - we'll keep you updated as this develops in the new year. Currently Available This Week: apples, beets, cabbage, carrots, kale, onions, parsnips, potatoes, rutabaga, salad greens, shallots, sweet potatoes, winter squash, parsley and rosemary, wild mushroom medleys, and more! We also have delicious bread, bagels, yogurt, pudding, cheese, eggs, maple syrup, granola, condiments, and local beef, lamb and pork. We will be sending out a short end-of-year survey soon and appreciate your honest feedback. 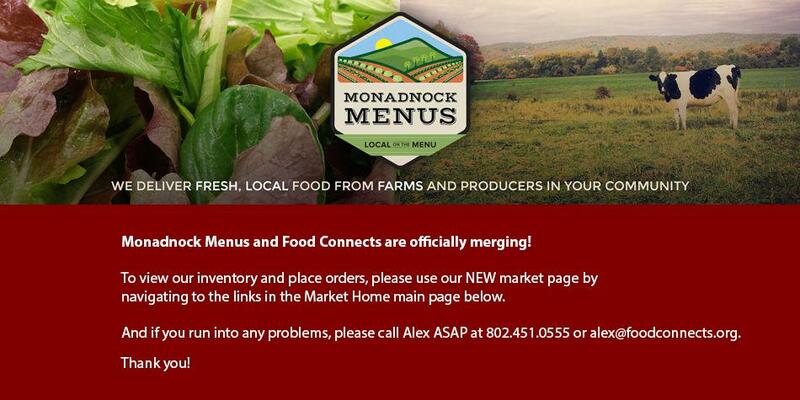 We want to make Monadnock Menus work well for YOU! Another opportunity to give feedback and connect will be at our Annual Meeting in early February. A Save-the-Date and more info will come soon as well. [December Harvest of the Month] www.vermontharvestofthemonth.org is Winter Squash! Check out the website for some great recipes and free educational materials for your cafeteria or shop. Thanks again everyone! It's been a great year - so close to our goal of $100,000 sales - we can do it!